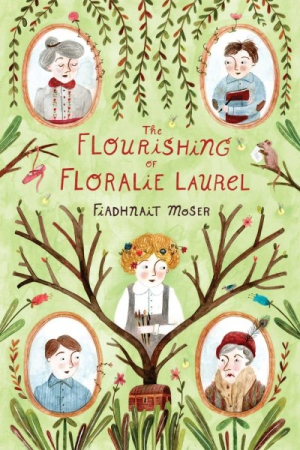 Fiadhnait Moser’s coming-of-age novel, The Flourishing of Floralie Laurel, follows its heroine as she rounds the first corner of adolescence and finds very adult problems waiting. As Floralie questions who her family members are—as caretakers and as people—she’s confronted with the complex and often flawed nature of those whom she loves and craves love from in return. It’s 1927, and Floralie is too old to keep roaming the streets of Whitterly End. Kicked out of her boarding school, she’s back with her older brother, but not for long. Innocence is edged with darkness as Floralie’s imagination helps her escape very real things: her father’s death, her mother’s unexplained absence, and sudden poverty, to name a few. Family secrets have festered into a silence, and she takes responsibility for understanding family rifts. Ultimately, Floralie deals with the complex anguish of loving a mentally ill parent, and the ways they can fracture a family and feed its dysfunction. There’s freshness to this novel, and also room to grow. Floralie is a visual thinker who understands the world in pictures. Heavy imagery creates a kind of linguistic impressionism; clarity is sometimes sacrificed. While self-expression is encouraged, and rightly so, it coexists with stereotypes about artistic temperaments and mental instability. Fantastical and poetic, The Flourishing of Floralie Laurel uses evocative imagery to explicate Floralie’s experience. On the cusp of adolescence, Floralie peers into adulthood’s penumbra and discovers the seeds from which her inner strength grows.